Are you tired of the endless hours of scrubbing and crawling around on hands and knees? Cleaning tiles and grout without professional products and knowledge will never achieve that fresh, clean look you’ll get when you hire Chem2Clean of Dublin. You might think that using some name-brand foam cleaner will clean and disinfect, but it doesn’t always work that way. Some germs and toxins stay in your grout, and only a commercial-grade cleaning solution will get rid of the grime before it affects you, your family, or your employees’ health. Our certified cleaning technicians will assess your tile cleaning needs and customize the cleaning process according to the job. 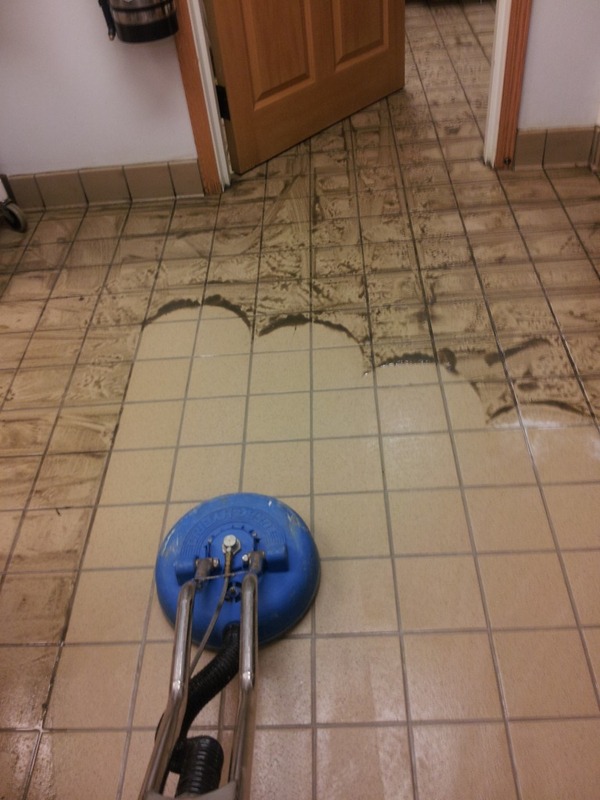 We only use top of the line equipment and safe cleaning solutions to ensure a clean tile. We will remove years of built up grease, dirt, and stains. Call Us today on 01 2354866 to learn more about our cleaning services. We Offer a FREE quotation! The following picture was taken in a restaurant located in Dublin. It had been years since anyone had cleaned the tile and grout Heavily baked grease and dirt stuck to the floor. We applied our Certified Cleaning Solution, agitate with our rotary machines and let solution dwell. Then extract with the turbo hybrid and a high powered truckmount machine. Tile and grout cleaning might not be a cup of tea. Naturally, grout is known to be a porous substance. As a result, if you spill wine, lemonade, or any other sticky substance on a tiled surface, you will experience marks and patches on the surface. As much as there are many challenges to clean tiles and grout, there are several methods that can be employed depending on the severity of the stain. Chem2Clean Dublin has over 20 years of experience in Tile and grout cleaning, so we ensure to deploy the best cleaning methods for your tiles. How to choose the Best Carpet Cleaner? What is an HEPA filter? How often should I have my carpet cleaned by a professional? You will get Private Discounts and Special Offers!